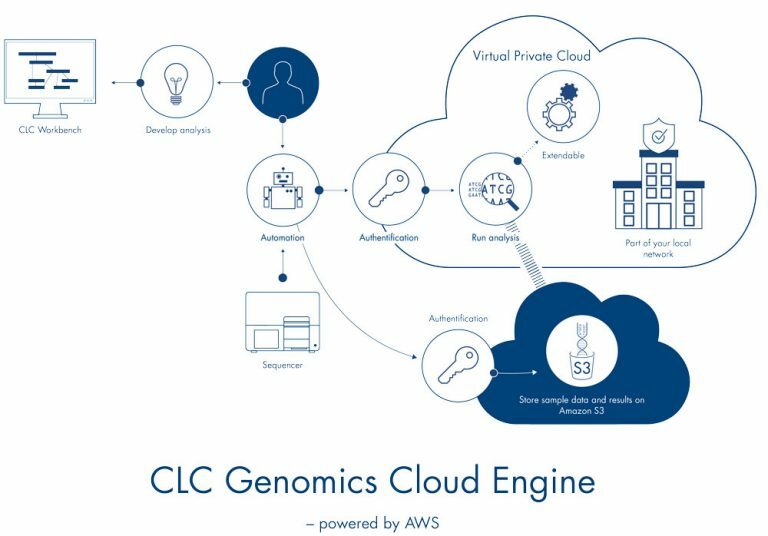 Launches your enterprise bioinformatics platforms into the cloud thanks to near-automatic rapid deployment. Within a week, you can have a completely deployed cloud environment fully capable of running analyses securely. Uses AWS cloud technology and runs in a secure, customer-owned VPC environment. Uses virtual private cloud (VPC) infrastructure to make the cloud a part of your on-site network. Scales to fit changes in sample production rate and analysis processing time within limits defined by you (using Amazon Auto Scaling). Job scheduling can be carried out, completely securely, from the internet. Comes with an easy-to-use command line interface to run CLC workflows. Supports CLC modules and plugins. Allows the use of CLC Genomics Workbench software for result visualization and interpretation, and for easy workflow design and validation.